This example shows how to set up and display a live histogram. The Image Acquisition Toolbox™ together with the Image Processing Toolbox™ can be used to display a video feed with a live histogram. This can be useful when calibrating camera settings such as aperture using manual controls. This example shows how to use the PREVIEW function, its associated custom update function and the IMHIST function to place a video preview window adjacent to a live histogram. The techniques here can be used to display other live information too. For example, a live video feed can be placed next to a filtered version of the video. directory, that displays the live histogram in a figure window. % Convert the input images to grayscale. An image object of the same size as the video is used to store and display incoming frames. % Retrieve the video resolution. % Create a figure and an image object. % MATLAB images are height by width, so flip the values. 2     % This callback function updates the displayed frame and the histogram. 4     % Copyright 2007-2017 The MathWorks, Inc.
7     % Display the current image frame. 10    % Select the second subplot on the figure for the histogram. 13    % Plot the histogram. Choose 128 bins for faster update of the display. 16    % Refresh the display. % display the video feed is also specified. % View the histogram for 30 seconds. 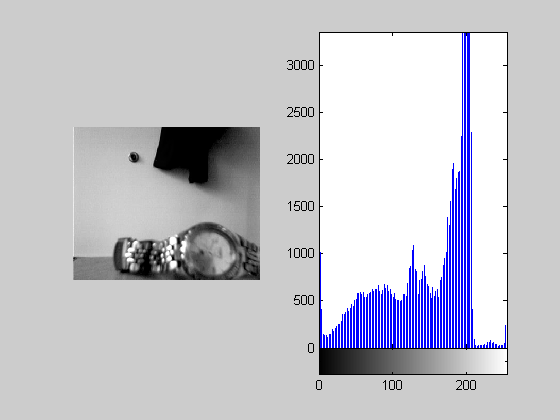 Above is a sample image of the histogram and video feed. % Stop the preview image and delete the figure.